Mektup was a Turkish import living in England with Importor/Owner Natalka Czartoryska. Mektup has been credited with living to be 18 years or more. However, we do know that she	was imported in 1973 from Turkey to England and that the people that knew the dog	best thought this dog was a year old when imported. This gives a more reasonable approximation of 14 years at time of her death (1987). One source said that she produced her last litter at the age of	thirteen (13) years but didn't state when they believed her date of birth to be. She died in 1987 of kidney failure, comon with older dogs. 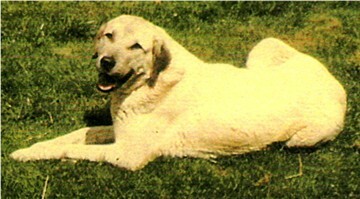 In 1977, Mekki, which she was sometimes called, was taken from England back into Turkey where she was bred to the beautiful white working livestock guardian, Akkus of Oltan. 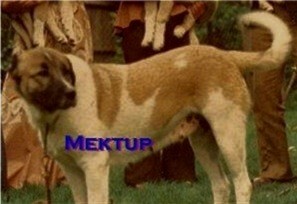 After this breeding, Mektup was re-imported to England where she gave birth to a litter of six puppies in quarantine. 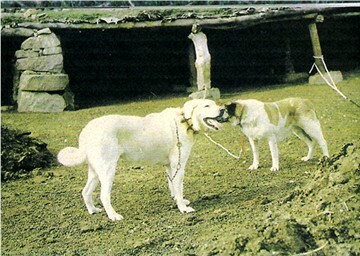 Mektup was a fawn pinto with large white markings and a black face. 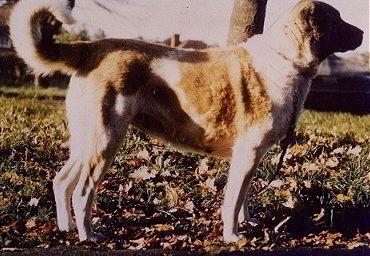 She was an exceptionally sweet and gentle Anatolian Shepherd. 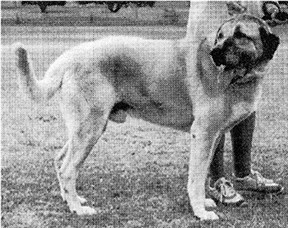 Mektup whelped a total of 8 litters between 1975 and 1982 (43 Progeny) and produced dogs which were sound, long lived and adaptable. She was hip x-rayed Hip Dysplasia clear and lived a long happy life with Natalka. Mektup ruled the roost until her death in 1987 from kidney failure. Akkus of Oltan and Metkup of Obruk in Turkey in 1977.